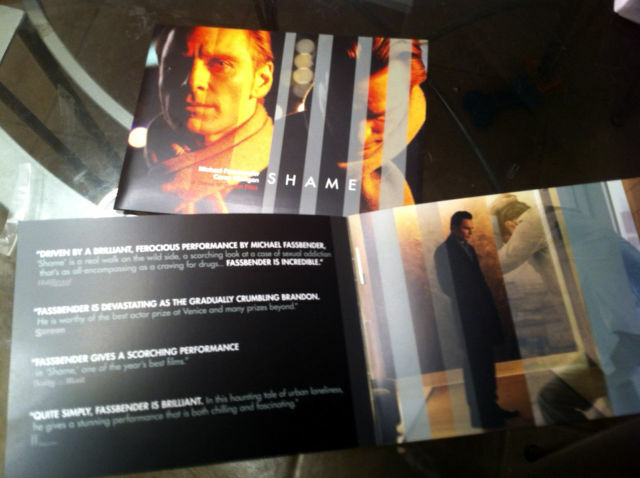 Not many exclusive things are tossed my way to share here at Fassinating Fassbender, however, a nice Fassinator lady friend's husband is a film critic, and Fox Searchlight sent him this handsome 'For Your Consideration' package and screener the other day. She took pictures of it and kindly shared it with me, and gave me permission to share with the FF readers. This is my first time seeing images of what those lucky few special souls receive this time of year from studios who want to remind film reviewers of special films and special performances. We all can agree that Michael's performance in Shame is nothing short of spectacular. And as per the current poll, the majority of us really enjoy the film. 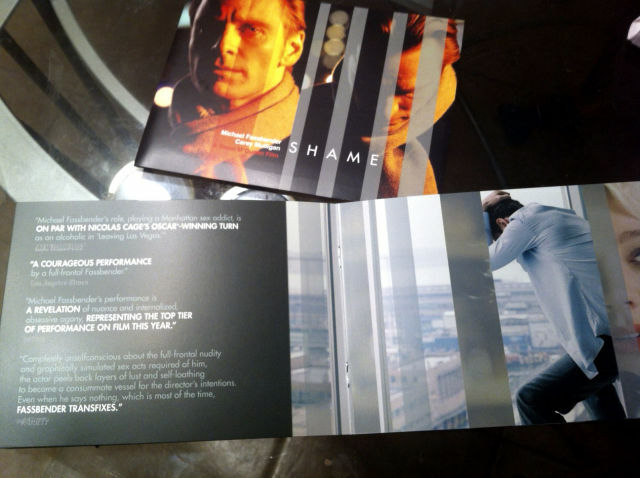 Here are several images taken of the FYC: Shame packet as the pages are turned to allow you to view the entire advert. Needless to say, I would really, really want one of these. I have been trying to ask a few peers about how I can go about contacting Fox Searchlight to inquire about how to get For Your Consideration ads here at Fassinating Fassbender. No one has provided the information so far. I have found one contact email address at Fox Searchlight, but the person has not replied back. I realize that Fassinating Fassbender is a single-themed blog, and I am not a big-shot blogger with deep pockets, press credentials, or precious industry insider contacts. I do not review all films, just the ones that Michael is in - therefore, I am a critic, just not a large scale general film reviewer. But this is the one and only primary Michael Fassbender fan blog, and it would be great for us to be able to do our share in helping to promote Michael Fassbender and Shame in having For Your Consideration advertising here. I have avoided ads in the past, and when I am solicited for advertising space, the product has absolutely nothing to do with the context of Fassinating Fassbender, and the readership would be put off by such ads. 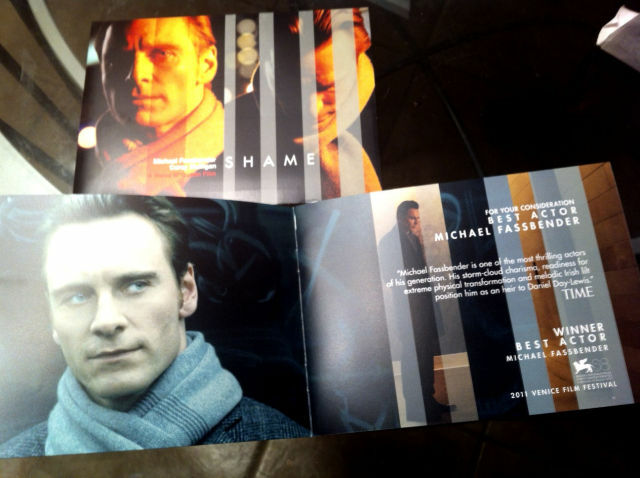 Now is the perfect time to embrace advertising if only for a short time frame, and for a film that features Michael, and has him on the radar for Oscar consideration. 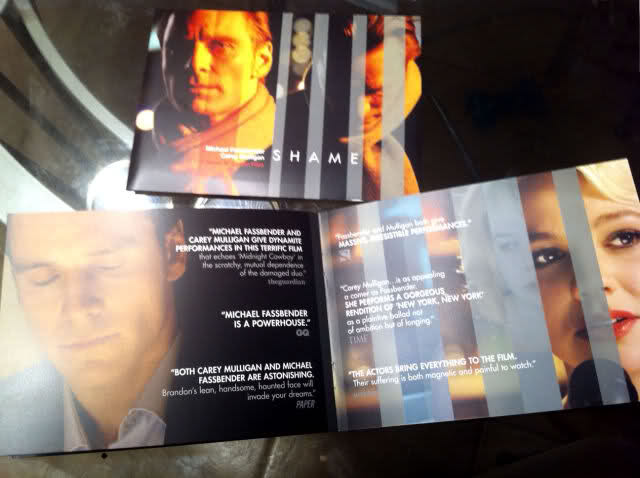 If you are able to assist me in or offer information about how to go about getting a FYC Shame ad here at Fassinating Fassbender, please email me at simonetvc@gmail.com Thanks! Thank you Emeline for signing the Guestbook, I'll check out those links. First, I don't have any exclusives to pass on - sorry! But here is a link to an interview with Michael and Steve McQueen on CBC's 'Studio Q' with Jian Ghomeshi. The interview took place during TIFF. Their insights into the film and the Brandon character are interesting! Enjoy! Second, have a happy & safe trip to London, Simone!